Tim Tebow is a natural in front of the camera, so he really didn’t need time to prepare while the brass at ESPN will welcome his viewer-friendly smile as well. 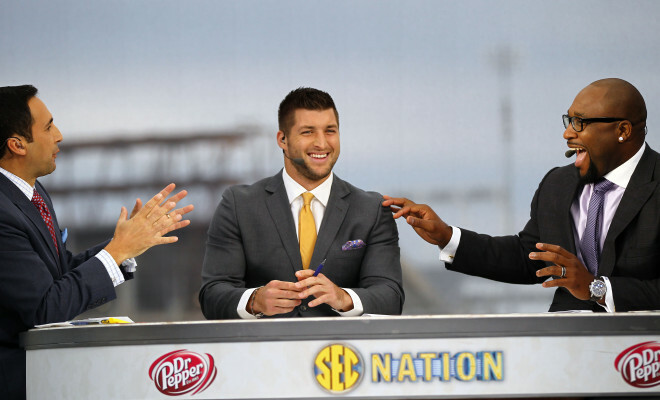 Tebow returns to ESPN this Saturday, Sept. 12 as an SEC Network college football analyst. Tebow will resume his role on the network’s two-hour traveling pregame show, SEC Nation. The show is live from Nashville, beginning at 10 a.m. ET (9 a.m. CT) prior the Georgia at Vanderbilt football game. “Tim quickly developed into an excellent analyst last year, and we were not shy about acknowledging his home at ESPN should he be available to return,” said John Wildhack, ESPN Executive Vice President. I think that quickly closes the door on any NFL returns.